Eden’s Rivers – Making Soap is Fun! The first reason is for health. The second is for joy. When I made my first bar of soap, it was amazing. I made soap ! I’d been making to make my own lotions and creams for years, but this was soap. It had bubbles and everything! Plus, I could scent it any way I wished. No more generic ‘clean soap’ scent for me. Do I want an orange scented soap? Then I can have one. How about making a blueberry-scented soap? I’ve got that scent too. Maybe I want to smell like apple pie. And yes, it’s a great scent. People have leaned in to smell me on days I bathe with apple pie soap. Of course, the skin care benefits are great as well. The apple pie scent have organic cinnamon in it to exfoliate the skin, so you’re baby smooth. 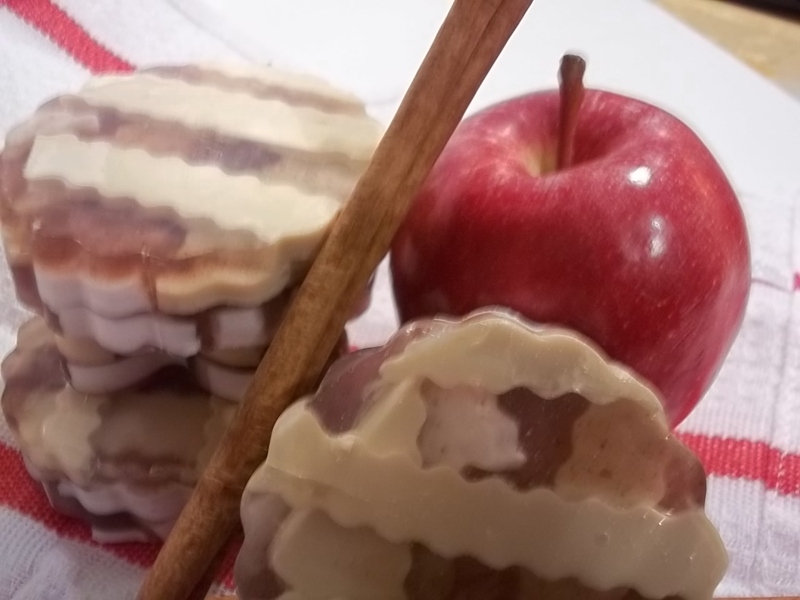 My most recent batch of apple pie soap turned out wonderfully. I used a recipe suggestion from Bramble Berry and the Soap Queen for Strawberry Pie soap, but I changed it to apple pie for the fall. It’s swirled with real cinnamon to exfoliate and the scent is wonderful–a mixture of fresh apples, caramel, and honey. Its shape is just perfect for holding in the shower. Plus, no more white bars of soap! One of the best things about handcrafted soap is that it doesn’t have to be that white bar of soap. It can be almost any color you can dream up. Yes, some colors don’t show up well in cold-processed soaps due to the initially high ph value of the lye. Still, the colors available are still miles away from the plain o’ bar in the drugstore. There is nothing like cutting into a block of soap to reveal swirls of color. And who doesn’t like ymmy pie first thing in the morning? « We’ve already had snow!